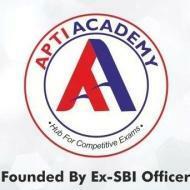 Apti academy providing classes ssc,bank and ibps. we have an experience of 4 years in coaching. We offer comprehensive classroom teaching for competitive exams. We have 3 center's in Pune. Each centre has excellent environment and uniform curriculum which is supported by expert faculties, who knows ins and outs of exam. In 2018, our 103 students got selected in different competitive exams. This year our 6 Students selected for SBI PO as well. We also have expert guidance and comprehensive classes for RBI Grade B exam. "Experience is really Good, all faculty is good for teaching, all faculty supports to any exam and Guidance to tackle that exam. Confidence level increases and knowledge also increases. " "Wonderful experience of being part of this academy. Best teachers and their easy way of teaching. I feel satisfied for chosing perfect coaching class. " "It is really nice institute. We get very crystal concepts, teachers are very friendly and director Sir is also soft behavior. " "Best classes in pune. Best teachers best teaching for all subjects. Very helpful teachers. Nice results. " APTI ACADEMY conducts classes in Bank Clerical Exam Coaching, IBPS Exam Coaching and RBI Exam. It is located in Sadashiv Peth, Pune. It takes Regular Classes- at the Institute. It has got 9 reviews till now with 100% positive feedback.